Since Nately’s Whore’s Kid Sister disbanded a few years back, their unique blend of brooding drone-pop, not to mention their explosive live performances, have been sorely missed. So fans of Nately’s should be very excited indeed at the prospect of new five-piece Okay Champ. Featuring former Nately’s members John Edgar on guitar and vocals and Stuart Walkinshaw on erm, ‘spaceship’ (their words not mine), Okay Champ also features Eat Fast (of which Edgar is also a member) and former Let’s Buy Happiness members Mark Brown on bass and vocals and James King on drums. Rounding up the troupe is David Turnbull who has previously played with Mass, Your Codenameis:milo and Obi Got Ludo, on guitar and vocals. So something of a local super group as it were. They’ve been together as a band “since Leonard Cohen died”, and describe their sound as “slightly menacing, slightly miserable, slightly funny” – a pretty apt summary of the track they’ve just debuted online, Ticket. Ticket combines the fuzzy lo-fi of Eat Fast with the heavier, sludgy sound of Nately’s to create a jittery sense of post-punk paranoia. Opening with a wall of discordant feedback before angular, biting riffs kick in, Ticket conjures up the same dark sense of dread that Nately’s so expertly mastered; that creeping anxiety lurking uncomfortably just beneath the surface. Edgar’s urgent, reverb-drenched vocals are barked over jerking guitars, further amping up the nervous energy for a wonderfully dissonant assault on the senses. 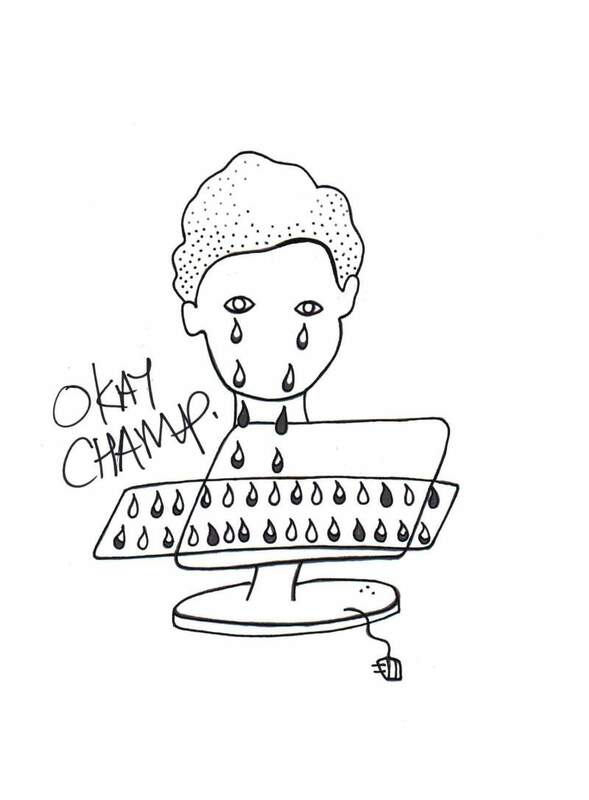 So what can we expect from Okay Champ? “Honesty and commitment. Friendliness and mild anguish. The occasional big riff.” Sounds good to us.